Many of the links between Trump and the Russians may be quite traditional – money and favour. But it would help to think in terms of three logical possibilities. The first would be direct contact, and the resulting exchange of techniques and even personnel with the Russians. The second possibility would be learning and copying, mainly from East to West, but at a distance – there are already several cases of political operators in the West who have studied or admired Russian techniques, and imported or adapted them. 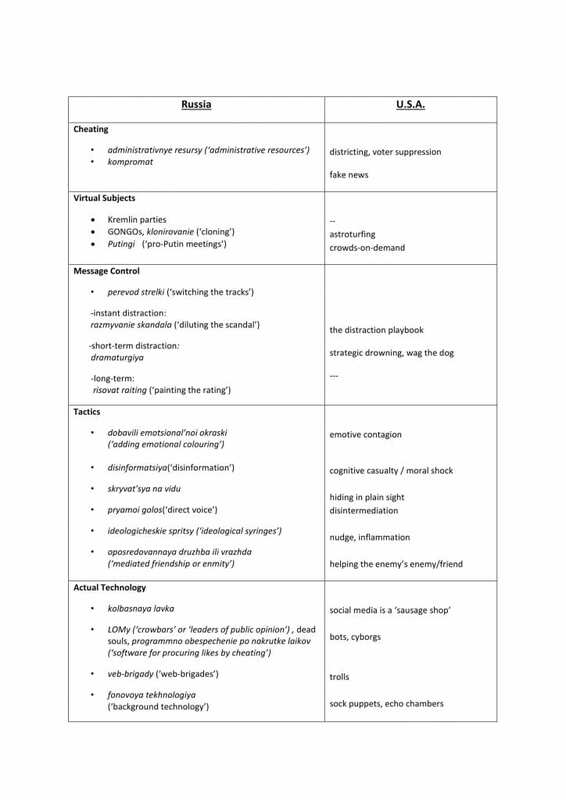 This type of learning does not have to involve personal contact, although it might; and the learning process could be selective or adaptive. The overall effect of Russian political technology is to strangle democracy; but selective learning need not have the same final intent, and could be just to gain comparative advantage at home. The third possibility is parallel development. It just happens to be the case that Western and Russian political operatives have ended up using the same technologies in the same way, largely because the technology is the same or similar. We need hard evidence to decide which is which. But, by whatever route, many of the techniques of Russian political technology now looks disturbingly similar to certain practices in the West. I have put the comparisons in a tentative table. There is a large amount of simple cheating in both Russia and the U.S.A.. The districting powers of US state legislatures have been used in an increasingly partisan manner to draw voting boundaries in favour of the Republicans. Hillary Clinton famously won the popular vote by over 2.8 million, despite losing in the Electoral College; but this is largely because of the conflict between state borders and population (as also with the Senate). On the other hand, the exaggerated Republican victory in the House of Representatives was largely due to gerrymandering: they won 55.2% of the seats on 49.9% of the vote, with the Democrats claiming 44.8% of the seats on 47.3% of the vote (on an initial count). But Clinton could have been even further ahead. So-called ‘voter suppression’ was a key factor, and much more or a factor that in 2012. Swing states like Wisconsin, North Carolina and Florida (all of which were won by Trump) have been able to enact barriers to voting like voter ID laws since the Supreme Court ruling (Shelby County v Holder, 2013) that gutted the 1965 Voting Rights Act. In Russia, this is called ‘administrative resources’ – using all the powers or the local state to block or artificially increase turnout, or just to stuff the ballot. Voter suppression techniques were also used on social media (see below), such as messages to minority groups that they could vote by text (with possible Russian help). 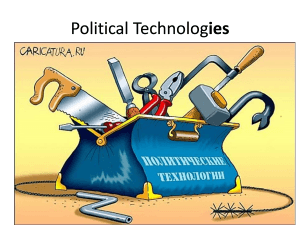 Russia has its own array of such ‘technologies’ – authoritarian states like Russia are not static. Every Russian election is marked by new means of manipulating the vote. ‘Kompomat’ stands for ‘compromising materials’, which is the Russian version of fake news. US audiences also got used to the Russian term with the leak of the dossier on Trump compiled by the former British spy Christopher Steele. There is a Russian saying that ‘the best kind of kompromat is true’, but it certainly doesn’t have to be. Damaging your opponent is all that matters. Kompromat is also a form of insurance, if everybody has materials on everybody else. It also therefore a systemic necessity, an entry card into politics: anyone who gets involved in politics is corrupt; honest politicians are rejected by the system. One key way in which the Russian political system works is that the Kremlin controls all political subjects: first politicians and political parties, now even NGOs (hence ‘GONGOs’ – Government Organised Non-Government Organisations). The phrase ‘even the opposition is controlled’ wouldn’t make sense in Russian: the opposition was the first thing to be manipulated and controlled. Fortunately, there are few signs of this yet in the West. Even European political parties that are routinely described as ‘Putin’s puppets’ are real; they have a life of their own; even if they take Russian money or benefit from Russian media assistance. But the USA is in many ways the home of ‘astroturfing’ – the creation of fake grass-roots campaigns. And it is also the world leader in fake science and lobby groups. The USA also has crowds-on-demand, political supporters assembled for money. Not unlike the way that Russia used spetsturisty , (‘special tourists’, but similar to the word for military ‘special forces’), and fake anti-Kyiv and pro-Putin protest ‘meetings’ (in Russian the imported word is mitingi) in Crimea and in eastern Ukraine in 2014. Controlling the message via controlling the media has always been a key part of the Putinist political system. Longer-term, Russia is a propaganda state, where Putin’s mega-ratings (currently over 80%) are created by elaborate dramaturgiya (a better Russian word than ‘narrative’), and where alignment with the official media narrative is a key means for elites to signal their loyalty. TV is therefore more important than the militia in maintaining popular control in Russia, although the amount of crude force in the governing formula has gone up since Putin’s re-election in 2012. In the short-tem, the key Russian media technique is perevod strelki (‘switching the tracks’), shifting attention from or burying stories that are unfavourable to the Kremlin. This is obviously Trump’s number one trick, with his most controversial tweets clearly timed to pre-empt difficult news cycles. Other tactics are straight out the Russian playbook, such as the ‘strategic drowning’ of other messages by shouting louder, using media-friendly shock tactics and the launch-pad effects of bot-nets (see below). This explains why Trump so often played with fire by pushing the buttons on the very issues on which he was vulnerable. He has destroyed or refused to hand over thousands of e-mails and documents in legal suits and bankruptcy cases; so he shouted ever louder about Clinton’s private e-mail server. After his election, Trump shouted about Clinton’s ‘election fraud’ so that less attention was paid to the real scandal of voter suppression. This tactic is ‘hiding in plain sight’. Strategic drowning also depends on selling an emotive message, especially for stories that can’t compete in terms of factual accuracy. The emotive overlaps with the demotic. The Russians long ago perfected what they call pryamoi golos (‘direct voice’). This involves another type of virtual subject, namely actors claiming to be the general public on TV. But more generally, it is what Americans would call ‘disintermediation’– the removal of intermediaries from the supply chain, in this case the direct appeal to voters over the heads of traditional media or even parties –which has been a Republican strategy since 1994. In different areas, though, the opposite approach makes more sense. The Russians have learnt that their own fake news only has a certain impact. RT only has a limited audience. It is better to ‘nudge’ other voices that are already out there. Although the Russian tem for this is very revealing – ideologicheskie spritsy , translated as ‘ideological syringes’, implying feeding an addiction or appetite to make it grow. The US equivalent would be the way that bot networks interact with the ‘alt-right’; both injecting messages into it and multiplying the impact of the alt-right into mainstream media. One way of doing this is of course divide-and-rule. It made sense in crude realpolitik terms for Trump supporters to help Sanders’ campaign. The campaigner Cassandra Fairbanks had an interesting story, migrating from Sanders to Trump via Sputnik news. 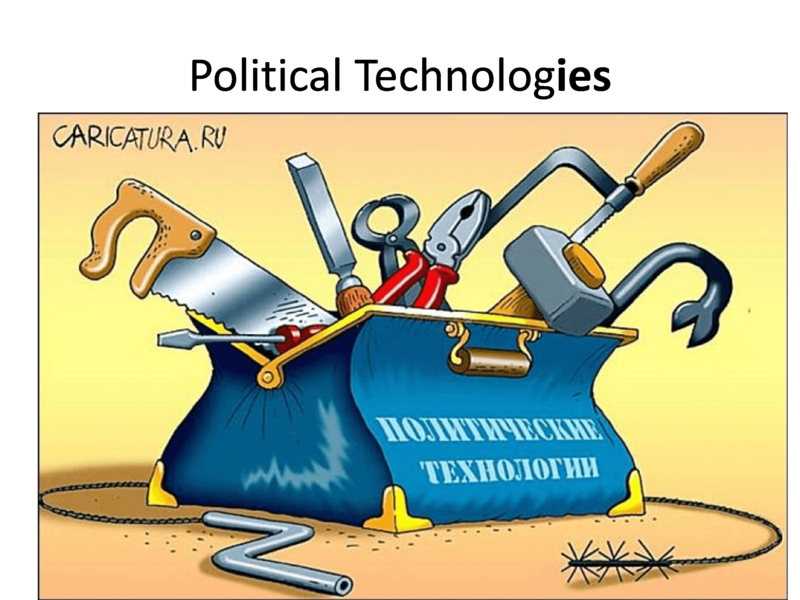 ‘Political technology’ in Russia moved into the mainstream in the 1990s. Back then, it didn’t actually use much technology. ‘Political technology’ was really of a type of political culture, with dirty tricks euphemistically elevated to the status of ‘technology’. But the next generation of political technology in the 2000s was built on partnerships with IT. This type of political technology looks a lot like what we have seen in the U.S.A. in 2016, as the technology is the same (although this makes it harder to detect whether the Russians were actually involved in this side of campaigning). Politicians can’t wait to grow real popularity on social media. It’s much easier to use bot-nets to launch hashtags or tweets. It’s also crucial to look popular, in order to be popular. In the U.S.A. this is already a normal, and a normalised, part of political campaigning. It would be premature to say that everybody does it, but there are indications that the Clinton campaign did. But Trump used the techniques to a much greater degree, and used them better. The same combinations of techniques are used as the Russians have developed over the last five years. Bots are good to get things started, but it’s better when real humans take over. ‘Cyborgs’ are a bit of both – automatic networks with human curators. According to one Ukrainian expert: ‘Fakes can be produced here by individual sources, by collective team (troll-farm), and by robo-bots’. Russians also talk about LOMy – which is an acronym for ‘Leaders of Public Opinion’ (fake or real), but also means ‘crowbars’ – as in the (forcible) leverage of opinion. Fonovaya tekhnologiya or ‘shadow technology’ means the use of social media teams or networks, not for direct propaganda, but to work away in the background; claiming that all politicians are crooks, or that the other side is spreading the fake news, etc. By the time the trolls, bots and ‘hammers’ have finished with it, social media is like a kolbasnaya lavka, nothing but a ‘sausage shop’. None of this is proof of collusion. But globalisation can lead to the diffusion of political techniques, just as it can increase the flow of people, goods and services. An excellent summation of how Russia is effectively using democracy against democracy. The problem is that even in Russia you can’t fool all of the people all of the time and as the tactics become better understood human ingenuity will develop an antidote. The sooner yhe better as Put in may be being very successful at bring democracy down but without hope for a real future the prolatariate will demand alternatives that Put in system cannot deliver.